This article first appeared in The Edge Financial Daily, on June 28, 2017. GEORGE TOWN: Malaysia’s embracing of Industry 4.0 — the digital transformation of the manufacturing sector — appears to be slow on the uptake as industry players grapple with funding issues, mindset shift and low expertise. Industry 4.0, introduced to encourage industries to move into computerised manufacturing to cut labour, reduce resources and ensure sophisticated accuracy, integrates the Internet of things (IoT), cloud computing, data integration and other technological advances into the heart of production and manufacturing systems. Semi Southeast Asia president Ng Kai Fai said Malaysia is still in the infancy stage in terms of automating, remaining mostly in the back end of line manufacturing despite 40 years of experience in the semiconductor segment. In fact, he said, local small and medium enterprises (SMEs) are still at the 2.0 level (mass production, assembly line) as global manufacturing in the electrical and electronic sector is evolving with disruptive technologies such as big data analytics, IoT and cloud computing. 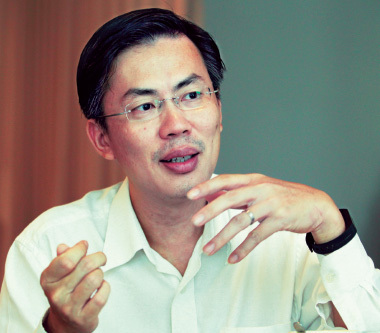 “In Malaysia, [we are] back-end-centric. But although back-end-centric, there is some automation, though it is still very much at the infancy stage. They should be encouraged to go into data management, big data, and for the automotive segment, players should look at automated guiding vehicle,” he told The Edge Financial Daily. Automated guiding vehicle is the use of mobile robots, guided by wires, markers and lasers to navigate in a factory, thus reducing the use of labour. “If you look at the growth of robotics, China takes the lead in terms of automation but China cannot [fully automate] because they have 1.4 billion people that they still have to delegate for work. “But if you take away China, the next phase of automation is Southeast Asia. Robotics adoption is going to be huge,” Ng said. MIDF Research analyst Martin Foo said to date, there is only a small traction in adopting automation because industry players are faced with financial issues while not being able to see the benefits of automating. However, the changing environment could prompt manufacturers to meet their customers’ demand as the latter’s orders become more sophisticated, he said in a phone interview. “Fully automating involves high expenditure running into several millions of ringgit, which puts off many manufacturers. There are also many industries which are labour-intensive and find it difficult to make that shift. “However, the benefit of going into smart manufacturing will be seen in the long run. Also, there are no incentives to fully automate. The government provides incentives for research and development but not automation,” he said. It should be noted that last year, the Malaysian Investment Development Authority (Mida) approved 24 applications for the Automation Capital Allowance introduced under Budget 2015 for the adoption of automation that has enabled companies to achieve average increment in production volume of between 200% and 300%. On Jan 12, Mida partnered with Rockwell Automation, a US-based industrial automation and smart technology provider, to groom local companies to increase competitiveness and share technical know-how. However, a Mida official, who declined being named, said industries were not moving fast to automate due to fear of expenditure and refusal to change business styles. “They would rather continue doing business the way they know for decades instead of evolving. Many of them also think it is the government’s duty to help them to automate. There is no drive to grow with the times,” she said. Vitrox Corp Bhd president and chief executive officer Chu Jenn Weng said Malaysia should focus on Industrial IoT (IIoT), a technology that uses IoT in manufacturing processes. He said that according to McKinsey Global Institute, IIoT is expected to contribute US$7.5 trillion (RM32.18 trillion) in value by 2025, and Malaysia is poised to grow in this segment with more push given to start-ups to create new technologies for local industries. “We have 40 years of experience and our unique positioning is that we are a manufacturing hub. If we fight with China or Silicon Valley, I think we will lose because China can come up with an IoT device in one week. They have a proper ecosystem, supply chain and they are building their own Silicon Valley in Suzhou. “We need to select where our strength is. We have a good chance to capitalise on the IIoT segment because everyone in Southeast Asia and China wants to automate their process and implement Industry 4.0. This creates a lot of opportunity if we all come together and work on IoT solutions,” he said. However, in an interview with The Edge Financial Daily, Chu said Malaysian manufacturers should not be the buyer but the creator, which is a sustainable long-term venture. "In my opinion, to create an integrated chip would be challenging but because of IoT and IIoT, creating the IoT product would be easier. What we need are start-ups to put the parts together, to be creative enough to put them together," he said. “We hope the government would take cognisance that apart from making policies to adopt IoT, it should also look at policies for the creation of IoT. “What would be a long-term strategy is how to incentivise local companies to build IIoTs, or at least be part of the formula that provides the solutions to multinational corporations (MNCs),” Chu said, adding that SMEs are important players in sustaining the country. “We cannot depend on cheap labour or foreign workers. MNCs are moving away because wages are getting higher and incentives from governments getting less. “If a local company wants to make its manufacturing more efficient, even with lower labour cost through automation, then it has a chance to produce at lower cost and be more stable. “MNCs are going into Industrial 4.0 with a lot of automation, connectors and big data analytics, but they can get Malaysian companies to help them to do this, a win-win situation, and this would make them stay here,” he added.